Two of the albums that I return to time and time again during my explorations of mystic turuq are Brian Jones Presents the Pan Pipes at Joujouka from 1971 and Bill Laswell's 1995 Apocalypse Across the Sky, both of which capture the literally entrancing sound of the legendary Master Musicians of Jajouka in their home village in Morocco's Rif Mountains. Six years ago I collaborated with Led Zeppelin biographer and Michael Jackson ghost writer Stephen Davis on a two-part profile of the Master Musicians. Between 1973 and 1989 Stephen made a number of visits to Jajouka, and he is therefore an important and reliable source on an important cultural tradition in which the music is sometimes drowned-out by the sound of axes being ground. When I asked Stephen to choose between the Brian Jones and Bill Laswell productions he plumped for the more atmospheric and authentic 1971 recording, but conceded that Apocalypse Across the Sky "sounds great". Personally I love Brian Jones' psychedelic vision of Jajouka, but as a self-confessed sound freak I am also very fond of the awesome sound that Bill Laswell captured. Laswell is still very active and has built a considerable reputation for producing visceral sound mixes. He has now joined up again with the Master Musicians and Bachir Attar supplemented by Laswell's own Material musical collective which includes Senegalese percussionist Aïyb Dieng to revisit the Apocalypse material. The recording was made at the 2015 Gent Jazz Festival and is only available as a high-resolution download (FLAC etc) from Bill Laswell's M.O.D Technologies label which is dedicated to exploring the outer reaches of both music and audio technology; Soundcloud sample via this link. To celebrate this new addition to the Jajouka discography I have conflated my two-part 2011 collaboration with Stephen Davis into a single article which appears below. This is long-form blogging with a vengeance, and I make no apologies for that. If the music and backstory are important enough, the word count should not matter. Brion Gysin died in Paris in 1986. I remember he always use to say that if the Master Musicians of Jajouka ever stopped playing, the legend that holds the world will end. He often worried about the chronic poverty of the musicians, and the diluting effect of contact with the modern world upon the ancient music. But the Pipes of Pan survive to this day. Listen to this music, the primordial sounds of a 4000 year old rock 'n roll band... listen with your whole body, let the music penetrate and move you, and you will connect with the oldest music on earth. That is William Burroughs writing about the Master Musicians of Jajouka. Today the Master Musicians are known to a wide audience through the albums produced by Rolling Stone Brian Jones and record industry maverick Bill Laswell. 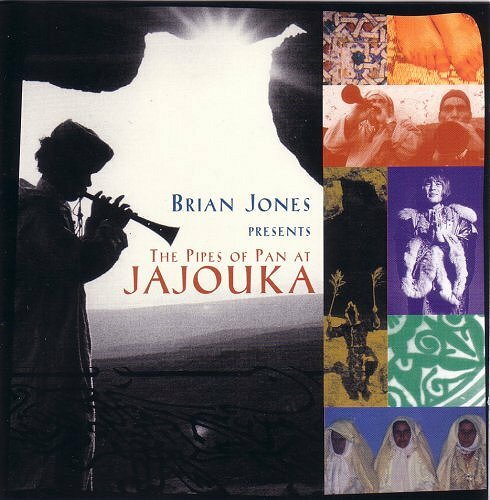 Their 1971 LP Brian Jones Presents the Pan Pipes at Joujouka has been described as the original world music album and the executive producer for its 1995 re-release was none other than Philip Glass. But despite this acclaim Brion Gysin's worries about the effect of the modern world on the ancient music proved to be well founded and the recent history of the Master Musicians has featured primordial music making and bitter internecine feuds in equal measures. These feuds prompted protests at Philip Glass concerts some years ago and still continue in muted form today, with two competing groups of musicians performing on stages around the world, each claiming to be the authentic 4000 year old rock 'n roll band. The Master Musicians of Jajouka are an ecstatic brotherhood. They hold the hereditary position of guardians and performers at the tomb of the Sufi saint Sidi Hmed Shikh in the Rif Mountains in northern Morocco where they perform ritual dances at religious festivals celebrating the goat-man Bou Jeloud and the demoness Aisha Qandisha. In the past the Master Musicians have been the official Moroccan court musicians and the sound of their distinctive oboe-like double reed rhaitas accompanied the Sultan's progress to the Friday mosque. Their performance tradition may predate even Sufism and the eminent Finnish sociologist Edvard Westermarck (1862-1939) suggested that the Master Musicians' wild music has its roots in ancient Greek Dionysian rituals. The transition from ancient to modern cultural icons came when Brion Gysin, whose circle included Paul Bowles and William Burroughs, hired the Master Musicians in 1954 to play in his legendary Tangier restaurant The 1001 Nights. Gysin's attention had been drawn to the Jajouka musicians by his friend the Moroccan artist Mohamed Hamri and when the Rolling Stones visited Tangier in 1967 Gysin took Brian Jones to Jajouka. The result was the album that started the world music bandwagon rolling and which also set the Master Musicians on a collision course with the modern world. Brian Jones and recording engineer George Chkiantz taped the musicians in Jajouka in July 1968 and Jones mixed and edited the album in London. But he died in 1969 and Brian Jones Presents the Pipes of Pan at Joujouka (that original spelling of the village has an importance that will emerge later) did not finally reach the stores until 1971, when it appeared as the first release on the new Rolling Stones Records label. With its insistent rhythms, beat generation connections and aroma of kif, the album quickly attracted a cult following, and a song with the refrain 'Ah Brahim Jones, Jajouka really stoned!' soon appeared in the Master Musicians' sets. Despite being a field recording Brian Jones Presents the Pipes of Pan at Joujouka was never intended to be a work of ethnomusicology and the liberal use of stereo phasing and panning in Jones' remix is typical of studio rock productions of the time. But the album succeeded in bringing the Master Musicians to the attention of the music cognoscenti and in 1991 the pioneer of 'collision music' Bill Laswell and engineer Oz Fritz travelled to Jajouka to record them using 12 track digital equipment. Laswell eschewed the post-production studio trickery of the Brian Jones album and instead presented the Master Musicians in startlingly lifelike sound on Apocalypse Across the Sky. William Burroughs supplied the title and sleeve notes, and the album is a sonic triumph although it does lack the atmospheric hashish haze that makes the Brian Jones production so special. The CD was issued on Laswell's own Axiom record label, it is now available as a high-res download and copies of the deleted CD can still be found - either format should be snapped up if it is not already in your collection. 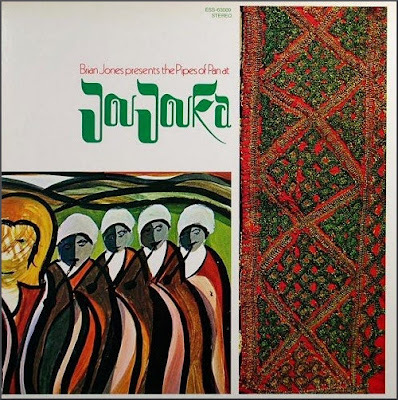 After a period out of the catalogue Brian Jones Presents the Pipes of Pan at Joujouka was reissued in 1995 under license to Point Music, a label which was a joint venture between Philip Glass, Michael Riesman and Philips Classics. This re-release, which is now only available as an MP3 download, changed the title of the album to Brian Jones Presents the Pipes of Pan at Jajouka. The retitled and repackaged disc created considerable controversy; because some of the original musicians were denied royalties from the reissued disc and Brion Gysin’s original sleeve note was edited to remove references to Mohamed Hamri, who is generally credited with playing an important role in bringing Brian Jones to Jajouka. In addition Hamri's artwork for the original sleeve seen as the second graphic in this post was replaced by the design seen below. These controversial changes, which sparked the protests at concerts by Philip Glass and the Master Musicians' leader Bachir Attar, were just one manifestation of a long-running feud that had split the musicians into two factions. This dated from 1988 when a progressive younger group led by Bachir Attar broke away from the more traditional Master Musicians. Triggering the split was a disputed double-booking involving a folklore festval in Marrakech and a TV film in Jajouka. All of which makes Brion Gysin's worries about "the diluting effect of contact with the modern world upon the ancient music" seem remarkably prescient. Despite attempts at reconciliation the split escalated and continues today with two competing groups claiming to carry on the ancient Moroccan musical tradition. In one corner are the Master Musicians of Joujouka led by Ahmed Attar, and in the other corner are the Master Musicians of Jajouka led by Bachir Attar (practically everyone in the village of Jajouka is an Attar) who recently played a Brion Gysin tribute concert in Tangier. The acrimonious split among the Master Musicians can be sampled in this post on the Joujouka group's blog. All of which rather overshadows the music that the Master Musicians have produced in their various groupings. 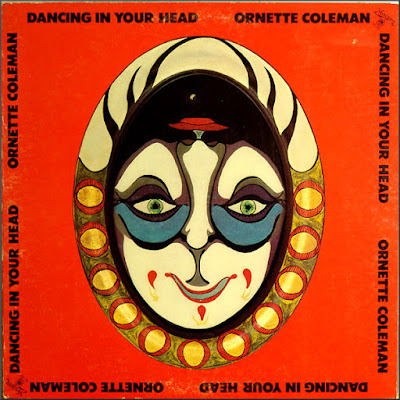 Following their acclaimed collaboration with Brian Jones the Jajouka band appeared on Ornette Coleman's 1977 album Dancing in Your Head and the Rolling Stones' Steel Wheels in 1989. In recent years the musicians from the Jajouka and Joujouka groups have worked independently with a wide range of musicians including Talvin Singh, Marianne Faithfull, the Klezmatics, and the London Philharmonic Orchestra on the soundtrack of the 2001 film The Cell. 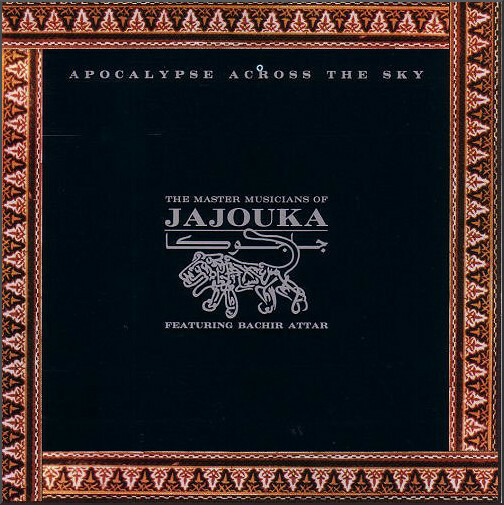 In 2009 the Jajouka group released the first disc on their own label Jajouka Records and went on to venture into dubstep with their Jajouka Soundsystem project. As I researched this article three things particularly struck me. First, the acrimony among the Masters and their followers is remarkable even for an industry that is famous for its dog eats dog culture. 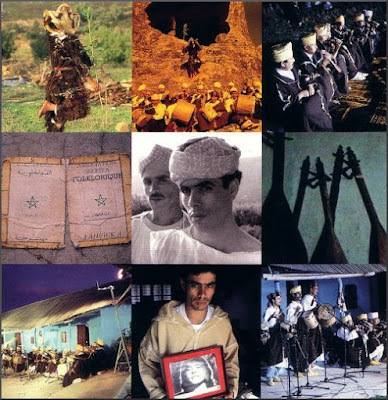 Secondly, almost all the published accounts of Jajouka and its music are written by transparently partisan supporters of either the Jajouka or Joujouka factions. And thirdly, what could be one of the richest available sources on the career of the Master Musicians before the 1988 split is usually discredited or ignored. In early 1973 music journalist Stephen Davis, producer Joel Rubiner and photographer David Silver spent several weeks in Jajouka on assignment for National Geographic. Stephen Davis went on to write best selling biographies of Led Zeppelin, Bob Marley and the Rolling Stones, and to ghost write Michael Jackson's autobiography Moonwalk. 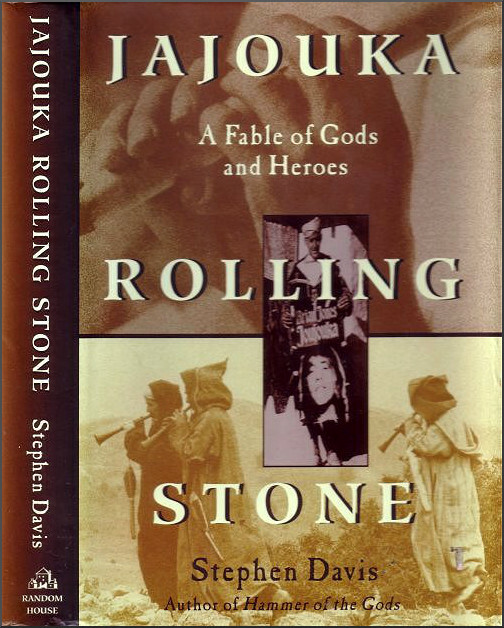 In between building his writing career Davis returned to Jajouka a number of times over two decades and in 1993 published Jajouka Rolling Stone, A Fable of Gods and Heroes. The dust jacket describes the book as "a magical debut novel", yet Jajouka Rolling Stone reads like a chronicle of Stephen Davis' time with the Master Musicians. The cast of characters includes Brion Gysin, Paul Bowles, William Burroughs and Brian Jones, the events and dates correspond almost exactly with other factual accounts, and there are extensive quotations from Gysin, Bowles, Burroughs and others. Yet the book was published as fiction. If you are confused, so was the public when Jajouka Rolling Stone was published by Random House in 1993. Although the book survived three hardback editions it eventually went out of print and is almost forgotten today. Which is something of a puzzle as Stephen Davis is one of the few people who was actually there with the Master Musicians in Jajouka. The provenance of the 300 page "novel" has always intrigued me, so after re-reading Jajouka Rolling Stone during a recent trip to Morocco I contacted Stephen Davis in the States and asked if he would finally tell the true story of the book. To my delight he agreed and our exclusive email discussion follows. Bob Shingleton: Stephen, let’s tackle the big question first. Jajouka Rolling Stone is subtitled A Fable of Gods and Heroes and it is categorised as fiction. Yet the book is a description of real events featuring real people, and a cross-check between the novel and factual accounts elsewhere shows it to be pretty accurate. Why was it published as a novel? Is the word on the street that the fiction label was a ruse to avoid litigation from some of those portrayed in it correct? Stephen Davis: Jajouka Rolling Stone, as a text, is a compilation of journal notes written on my trips to the Ahl Serif tribal area of the Djebala hills of northwest Morocco between 1973 and 1989. Some of these journeys were professional assignments, while others were personal visits and musical tourism. Some of the writing originated with encounters in London and Paris as well. BS: Now we understand why Jajouka Rolling Stone was published as fiction are you able tell us if and where it deviates from real events? SD: Actually, Jajouka Rolling Stone is a memoir. Everything in it – everything and more – happened. I went to Morocco in 1973 on assignment from National Geographic magazine to write about the Master Musicians of Jajouka. Photographer Martin Rogers and I stayed until the late spring of 1974. Our work was never published, I heard, because of the references to kif smoking in my text. I returned to Jajouka in 1977, 1979, 1981, 1986, and 1989. The text of the book is basically a rewrite of my notebooks from those journeys. BS: When Jajouka Rolling Stone was published reviews focussed on the fact versus fiction aspect. It is fair to say that the reception for the novel was less than rapturous and it seems to have been less successful commercially than your other books. Were you disappointed with the market reaction? SD: You mention reviews. I never saw one that I can remember. I never saw Jajouka Rolling Stone in a bookstore. No one got the book, especially the publisher and the booksellers. I asked a clerk in a snooty, hipper-than-thou (and now defunct) bookstore on Madison Avenue in New York, and he said, “Oh, we’re not carrying that book.” I never understood it. It was like a fatwa. There was no British edition, no translation rights in any language. I thought I was going to be the next Bruce Chatwin. But then I remembered how small the market for fiction about modern Morocco must be. Morocco didn’t pass the who-cares test in the West. In the end, I was amazed the text was published at all, and proud of how great the book looked and felt. As you point out, it was less successful commercially than some of my other work. (I’ve never even seen a royalty statement.) I love it anyway. BS: Jajouka Rolling Stone was published several years before Brian Jones’ seminal Jajouka album was licensed to Point Music and re-issued. That 1995 re-release caused considerable controversy because it did not include some of the original musicians in the royalty deal, and Brion Gysin’s original sleeve note was edited to remove references to Mohamed Hamri who played an important role in bringing Brian Jones to Jajouka. The Point Music CD sleeve notes also included an extract from Jajouka Rolling Stone. What was your take on the controversy surrounding that 1995 re-issue which resulted in protests at Bachir Attar and Philip Glass concerts? SD: This is a hard question because the story of the Jajouka/Joujouka schism is so complex. I won’t go into it here. The recent history is retailed on competing websites and is still going on, the flames being fanned mostly by outsiders, but real enough in the village as well. 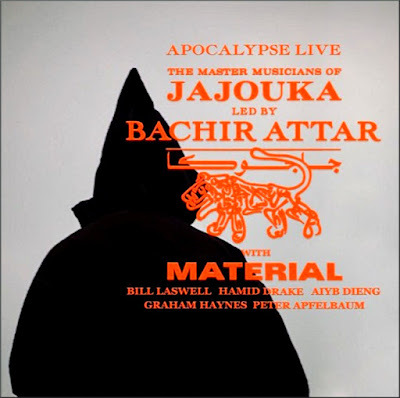 My take is that I support the work of Bashir Attar, son of the late chief Abdeslam Ahmed Attar (“Jnuin”) and consider him the leader of “The Master Musicians of Jajouka,” legatee of the tribal rhaita band that played for, and were recorded by, Brian Jones in July 1968. BS: One thing that struck me about Jajouka Rolling Stone was that you are fulsome in your praise of Apocalypse Across the Sky, but you do not credit Bill Laswell for producing an album that sonically stands head and shoulders above Brian Jones’ Jajouka recording. Was the omission of Laswell’s name an oversight, or was there another reason? SD: Laswell/Shmazwel. It is true that Apocalypse sounds great, but the quality of the music is only … ok. The band that recorded this music in Jajouka was cobbled together by Bashir Attar, with a couple of his brothers, and – I was told – some outside wedding musicians from Ksar el Kebir, the nearest big town. Bashir did it for the money, which was good. BS: In his sleeve note for Apocalypse Across the Sky William Burroughs tells how Brion Gysin was concerned about the diluting effects of contact with the modern world upon the ancient music. 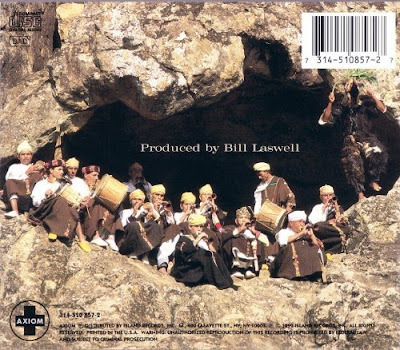 Since then the Master Musicians of Jajouka have embraced fusion and worked with Talvin Singh, Howard Shore, the London Philharmonic Orchestra and others. Do you think the ancient music of the Master Musicians has been diluted since you first heard them in 1974? SD: Bill Burroughs’ notes on Apocalypse were not his best work. He gets Brian Jones’s dates wrong, and doesn’t give much sense of the village or the music before turning on the colored lights, the purple prose. And its not like the music has been diluted; its more like it has disappeared. Brion Gysin used to say that Bou Jeloud will dance in Jajouka until electricity comes up the mountain. That happened about ten years ago, and there is also now a mosque in the village. So, the old rituals – starkly pagan rituals involving wild music and animal sacrifice -- no longer really exist except as an occasional show for foreign visitors. The long, big-band anthems like “The 55,” which once accompanied the sultan to prayers and the army on the march, have obviously lost their ceremonial and authentic meanings, and are now performance pieces preserved by Bashir Attar and his troupe, which still puts on a great and stirring show, to their everlasting credit. And if you go to the village, they’ll still give you a cup of tea and a pipe and play some Jibli mountain music on gimbris, flutes and violins. So, in a “diluted” form, it is still there in some sense. BS: Steve, you are a best selling music writer. Your books have portrayed, among others, Led Zeppelin, Bob Marley and the Rolling Stones, and you showed how highly you rated the Master Musicians of Jajouka by writing a book about them. Now, almost twenty years later, are you still listening to the Master Musicians or has your assessment of them as up there with the greats changed? SD: Yes, I still listen, especially to the many cassette tapes I recorded in Jajouka over the years. And of course I buy Bashir’s recordings as they become available. He’s a soulful guy and a great musician. He was 12 when I met him, a dancing boy in a frilly pink dress. BS: Over the years you have been very close to the action in the record industry. That industry has changed dramatically since Brian Jones produced his 1968 album, which you describe in the book as possibly ‘the original “World Music” album’. The Master Musicians of Jajouka, like many others, now have their own record label. But times are not getting any easier in the music business; so how do you see the prospects for niche acts like the Master Musicians and how do you see the future of the World Music segment? SD: I still think the Brian Jones recording is the alpha recording of the World Music movement that probably peaked with the Ry Cooder / Ali Farka Toure Talking Timbuktu album back in the Nineties. I have no idea where recorded music is going now, except that in order to keep their families in food and drugs, musicians now actually have to go out and play to make money, which has to be a good thing in the end. BS: You first visited Morocco almost thirty years ago. Have you been back recently and how do you think the country is changing? SD: I first visited Morocco almost forty years ago. I went back in 2008, and again typed up my notes, which were published in 2010 under the title To Marrakech By Aeroplane. And anyone interested in Jajouka should see the great documentary The Hand of Fatima (2009), a film by Augusta Palmer, the daughter of the late writer Robert Palmer, who first showed me how to find the yellow brick road that leads up Owl Mountain to Jajouka. And thanks for your interest in Jajouka Rolling Stone. BS: Stephen, thank you for your participation which made this important feature possible. * The sleeve notes of Brian Jones Presents the Pipes of Pan at Jajouka and Apocalypse Across the Sky, and the header quote is from William Burroughs' note for the latter album. 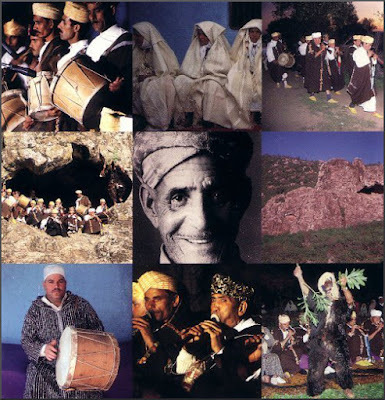 * The website of the Master Musicians of Jajouka is here and that of their Joujouka counterparts is here. This material was first published in a slightly different version in May 2011. Hi this is Cherie Nutting for Bachir Attar.Thank you for the article and we thank Stephen Davis as well.There are a few details missed. Most of the other group are not from the village but from the valley surrounding the village.Outsiders composed this group when we brought The Rolling Stones to Morocco.They never played with Bachir's father save one person who was a minor drummer and he was fired by all of the musicians. The Bill Laswell recording is not a recording of the wedding musicians.Most on the album travelled with Bachir on the USA and Europe tour. Those alive still travel with Bachir. Berdous and the 4 elders returned to the group around 1993 and this is stated in "Jajouka RollingStone".Old Berdous had wanted to be leader but later asked to be with Bacher and he accepted them..They also toured and they are on the great Womad CD made in Peter Gabriel's studio in 1994/5. entitled "Jajouka Between the Mountains"
The people in Jajouka regard Bachir as leader and they loved the free Festival Bachir held in 2015 with Brian Jones' grandson, Howard Shore,Donovan, Jillala, Lazywall as well as well as The Master Musicians of Jajouka led by Bachir Attar.The entire village watched and loved the performance giving a thumbs up all over the village. However we love that Stephen clarified some things regarding Bachir as authentic leader.He was brave and stated how bad Hamri was and he was fired in 1973 by Bachir's father and all of the musicians. However we do love this article and we thank you for supporting Bachir Attar and The Master Musicians of Jajouka..Thank you Very Much for your support.We hope that people download the new collaboration with Bill Laswell at the Gent Festival.It is really great. Again thank you very much. sir: thanks for the note from Cherie. 1. brian jones did not visit jjka in 1967. 3. 2 Ls in Shmazwell.